The world is consuming more energy. In 2013, the US Energy Information Administration’s (EIA) reported that the world would consume 56% more energy by 2040. While increasing the capacity of gas turbine generators may seem very logical, the capital intensity of this approach is often a hindrance. 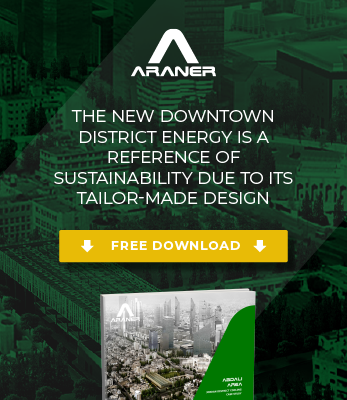 ARANER has discovered a less costly alternative-Turbine Inlet Air Cooling (TIAC). TIAC is a very effective as it is capable of enhancing turbine output by as much as 20%, yet this costs 30% less than installing a new turbine. One of the most interesting aspects of this technology is that it can be combined with thermal energy storage (TES) for an even more cost-effective solution. Although thermal energy storage (TES) has been a subject of research for decades now, many people are still not aware which the most relevant heat storage materials are. Power plants mostly use water and ice storage technologies, which are the focus of this article. The TIAC system consists of chillers, energy storage tanks, coils, piping and controls. The role of energy storage tanks is to produce and preserve thermal energy. These tanks are usually “charged” when energy demand is low and “discharged” when the demand increases. The energy storage medium is the single most important component in this system. For the sake of system robustness, the choice of heat storage materials depends on careful consideration of thermal stability, material properties, and cost. These factors limit the number of options greatly. Not to be ignored are the thermo-physical properties: coefficient of thermal expansion, density, thermal conductivity, and so on. In view of this, most turbine inlet air cooling systems have settled for either ice or cold-water storage tanks. The chilled water storage tank uses the principle of natural stratification. As a sensible (term described later) energy storage medium, the chilled water remains in fluid medium. There are two main operations in the working of a chilled water TES tank: “charging” and “discharging”. During the “charging” cycle, the thermocline moves from the bottom of the tank to the top. Chilled water enters the tank at the bottom as warm the water leaves through the diffuser at the top of the tank. The “discharging” cycle is generally about removing chilled water from the tank. In this case, the bottom diffuser discharges the tank as the top diffuser returns the water to the tank. This is after the chilled water has passed through the load. The thermocline starts from the top, and then moves slowly towards the bottom of the tank. There is no big difference between chilled water and ice storage types, except that ice is the storage medium in the ice storage tank. These tanks are less common than chilled water storage tanks, the main reason being that ice storage tanks are comparatively too complex to build and run. In this technology, ice is produced at night during low electricity demand. The chiller in the system produces ice during the off-peak hours. The chiller in this system requires more kw/ton than a conventional chiller to create the ice. During the on-peak periods of the day, the ice in the tank melts, and the chilled water circulates in the system’s water lines. An ice storage tank can be based on either ice harvesting (dynamic) or ice building (static) methodologies. A static system involves ice production from multiple tubes or coils submerged in the tank. The tubes carry a fluid whose freezing point is lower than that of water. Because of the low freezing point of the fluid, ice forms at the surface of the tube. When it comes to the dynamic system, ice forms on evaporator surface plates. When the ice is thick enough (predetermined thickness), it is released into water-filled tank below. Repeating this process many times produces a lot of ice, which can be discharged during the discharge mode. Ice and cold water storage tanks dot power plant facilities for good reason. The value proposition they add to chillers is incontestable. Since every plant is looking for maximum energy generation and revenue, the widespread use of the two mediums makes sense. If you would like to learn more about these technologies, do not hesitate to contact ARANER today. With the increasing energy demand, natural gas power plants are in pressure like never before to ensure that supply remains at par. These facilities must be flexible enough to serve not only the predictable demand changes, but also the unexpected demands from storms, equipment overloads etc. The balancing act introduced by energy storage provides the much needed flexibility and reliability. As we determine the best heat storage materials for power plants, we must understand the different thermal energy storage systems. Latent Heat Storage relies on the changing state of the storage medium. Mediums used in this method are popularly known as phase change materials. Sensible heat storage happens to be the most popular type of TES in the power sector. It uses water, rocks, sand, molten salt or any other solid/liquid medium. In this system, thermal energy is stored by cooling a substance (liquid or solid) without any phase change. The choice of substance is mostly based on the temperature level. For instance, water is ideal for any applications below 100°C. Thermal-chemical Storage (TCS) is based on the capability of a material to undergo chemical reactions. Latent heat and sensible heat storage are already established technologies, but TCS is still in its infancy. Though this technology offers good energy density, its costliness is usually a hindrance for many facilities. A natural gas power plant, especially if in a hot climate, can never go wrong with thermal heat storage materials as applied in TES technology. The inherent advantages of this solution have made plant owners to take advantages of the many options available. Chilled water TES is particularly popular for its simple design and maintenance requirements. Let us know in comments what you think about these the best heat storage materials featured here. Ice and cold water storage tanks dot turbine inlet air cooling systems for good reason. The value proposition they add to chillers is incontestable. Since every plant is looking for maximum energy generation and revenue, the widespread use of the two mediums makes sense.